In the US, eBay is running a single-seller promotion, and in the UK, eBay is running a flash sale in the electronics category. 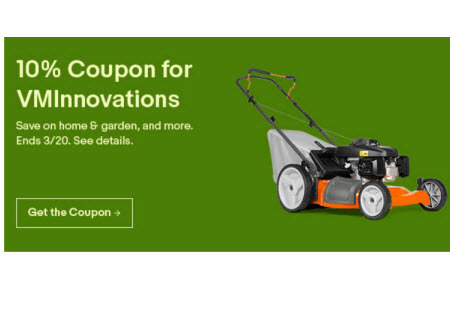 eBay.com kicked off a promotion on March 14 that runs through today, March 20th, in which buyers can receive a 10% discount ($25 minimum purchase required) – but only for items from a single seller: vminnovations. In the UK, meanwhile, eBay is running a 1-day flash sale in select categories in Electronics. It’s giving a 15% discount (£20 minimum purchase required) from 10 am to 8 pm UK time on March 20, 2019. Be sure to read the full terms and conditions for details and restrictions.